This weekend was a little murky with all the rain and, although there were a few garage sales, it was a messy day to try to get out and do anything. The rain was so refreshing this weekend, not just because it had been hot, because it had been a wonderful break from chasing good finds and more of a day to work on creating something new from them. That brings me to my most favorite of all creations on this rainy weekend. One of my girls came up with the great idea to do a Tuscan basket and incorporate the rich colors and green into the basket. I thought it was a wonderful idea, and my imagination immediately began to run away. I saw dark oranges, reds and browns, rich purples and lots of lush green. I could just imagine how I wanted the basket to look, but I couldn’t quite figure out what I’d put inside, how I’d incorporate my bakery items into a Tuscan themed basket. Then I came up with this. I created loaves of faux bread and made a kraft paper bag for them to give them a real bakery feel. Then I made a black currant jam candle to place in the basket, but when my daughter, Courtney, looked at and said, “What about cheese?” I thought that was such a great idea! I looked around at different Italian cheeses to get a little inspiration and it was the best thing I could have done! There were so many cheeses that inspired me. In fact, I ended up making a Tuscan Treasures board on Pinterest that included some of the cheeses I came across as well as some of the beautiful resemblances of Tuscany. I mean, you’re talking about gorgeous! 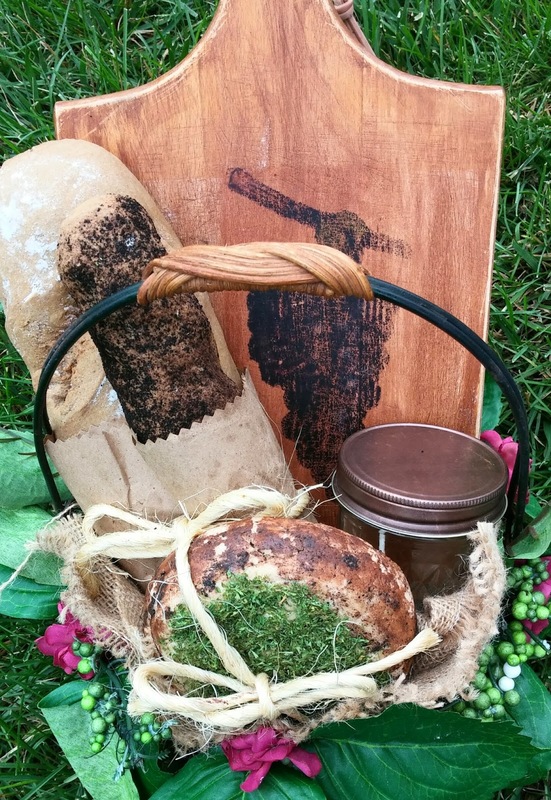 So if you take a look at my Pinterest board, you’ll see some of the lovely things that inspired this basket, including the different bread styles I used in comparison to my other more primitive style breads and the lovely Chèvre cheese that I recreated with a little Everything Dawn twist. Once the basket was filled, there seemed to still be something missing so we added one of the cutting boards I picked up at a yard sale to give it more a cheese board “thing.” I cleaned, dried, and stained the wood cutting board, distressed it and then transferred a picture of a cluster of dark purple grapes onto the cutting board to give it rustic, vineyard charm. The basket’s beautiful wrought iron, handle and base were both rusted for even more of a rustic touch. It was then that I put all of the elements together. I absolutely love this basket! It's definitely a unique decorative accent for the Italian table. You can see more pictures of this basket in my Etsy shop.